There’s a thing called Tree Kale: a group of tall, sturdy perennial brassicas, big enough to be considered trees and crowned by large edible leaves. They’re not often seen here in Britain but you can easily buy seeds for the ‘Walking Stick Kale’ variety. That’s the one where people traditionally cut and cure the main stem into an attractive and long-lasting walking stick. 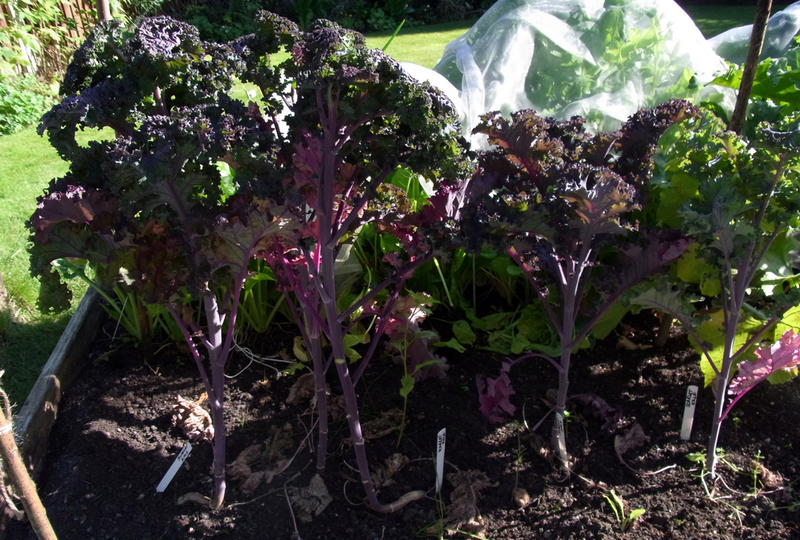 Just over two months ago I planted out some ordinary scarlet kale. 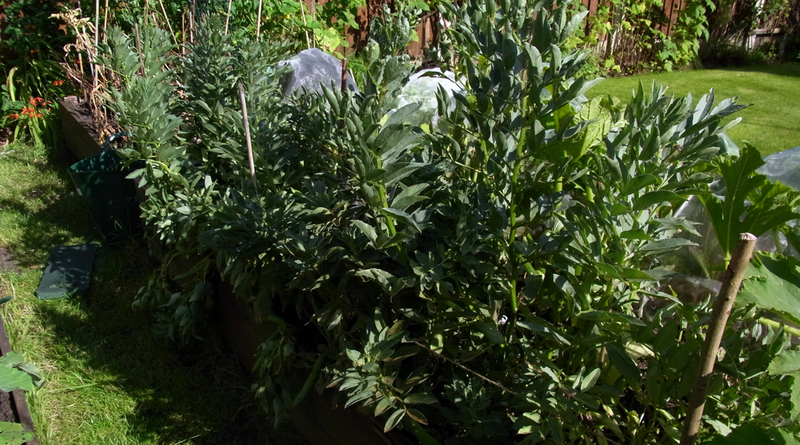 Raised from seed, the half a dozen plants sat under a mesh cover until today and it had been difficult to see how they were growing, surrounded as they were by broad bean plants. But today was broad bean harvest day and as I cut down the spent plants the kale was revealed. I was struck first by its colour: a deep purple, similar to the colour of grapes but with a matt finish. It was quite startling against a background of everything else being green. Then I noticed just how tree-like they looked side-on: with a single stem/trunk and lots of branches and leaves near the top. You can see how bigger varieties would have a tree-like habit. Close-up the leaves remind me of those fractal patterns that were popular years ago, with their infinitely frilly edges. For now they’re back under cover again to protect them from the dreaded cabbage white butterflies, which have been absolutely rampant so far this month. That broad bean cull earlier was something I look forward to every year as broad beans are my hundred per cent favourite vegetable. I grow The Sutton as it’s a dwarf variety, reaching no more than three feet and usually less than that. Growing in a back garden makes you favour smaller veg plants rather than tall ones as otherwise you can end up losing the view of the non-veg growing rest of the garden and sitting on the patio staring at a wall of green. But Suttons are also a great choice for flavour. They have an almost nutty taste in the background and if you cook them just right they fairly melt in your mouth. I always take the time to deskin them. A quick blanch followed by plunging into cold water makes it easy to pop the skins off and it can be quite therapeutic to spend a few minutes working through a pile of them. Of course you then see the beautiful true colour of broad beans: that delightful lime green, which survives cooking so always looks fabulous on the plate no matter what the accompaniment. I picked three kilos worth, still in their pods. Grown organically as they are, that would cost something like £15 in the supermarket. Not a lot of monetary value but blanched and frozen into portions there’s now a great supply of my favourite vegetable ready for eating. Oh and there’s now a free row in one of the beds. To fill it I’m currently trying to decide between Pak Choi and Broccoli Raab. The Pak Choi is a purple variety, which could look very attractive alongside its purple mini-tree neighbours. Your kale looks and sounds absolutely glorious! Am still trying to like broad beans. I feel I should…any tips on recipes? Thank you 🙂 I just hope it tastes as good as it looks. And that the critters don’t eat it first. Broad beans I could eat with cornflakes, but seriously they go well as a base for something like a piece of white fish with a drizzle of herb or lemon oil. Or mixed in with some fried chorizo as a side. Then there’s coating them in spices and baking them till they’re crisp .. drool ….